Jeff Rankin (B.S. ’15) has formed life-changing bonds throughout his life: in the Air Force, at St. Mary’s University, and even during barbecue cooking competitions. Each of these relationships played a role in helping the Iraq War veteran transition from active duty, to college, and then to a new job just two days after earning his Environmental Science degree in December 2015. He once protected Air Force One for Presidents Bill Clinton and George W. Bush; Rankin now protects the environment as an environmental consultant and inspector for GeoSolutions Inc. in Bracken. As a member of the 89th Presidential Security Detachment, Rankin traveled to 32 countries while active duty. He was medically separated from the Air Force in 2005, two years after being deployed to Iraq at the start of Operation Iraqi Freedom. He started his own towing company but sold it after five and a half years to begin college as a business major at the University of Texas at San Antonio. But something was missing — a brotherhood. Rankin soon found one after transferring to St. Mary’s. “At St. Mary’s, you are somebody. You’re not just a number,” Rankin said. He quickly felt a bond with the St. Mary’s community. His professors helped him through the “good and bad times” he experienced as a war veteran, and he also grew close to fellow veterans on campus. Rankin helped establish the St. Mary’s Student Veterans Organization (SVO) and served as its second president. Rankin credits St. Mary’s and the SVO for making it easier for a war veteran to pursue higher education, his military service for giving him the focus to complete his degree, and his award-winning barbecue for helping him land his new job. Under the team name “10 PT BBQ,” Rankin and his wife, Stacey, have won numerous competitions across Texas, and he is a certified judge for the National Barbecue Association. Awards aren’t the only thing Rankin has picked up at barbecue competitions; he also learned about the opportunity at GeoSolutions by networking at those events. 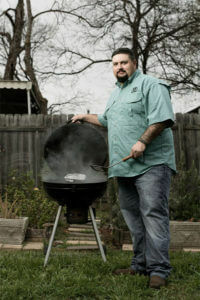 Rankin won’t divulge his secrets of his championship barbecue, but he does have an important message for veterans. “I would ask the veterans to take the time to meet the SVO,” Rankin said. Fresh out of college and now on a career path, Rankin holds close what helped get him there.